NEWARK, DE. — It was a few moments before Delaware’s opening kickoff with Jacksonville on Thursday night and suddenly, Dave Brock was the loneliest man on Tubby Raymond Field. It wasn’t like Daniel, heading into the Lion’s Den in some ancient, Medo-Persian prison, or even Spartacus looking at the battlefield near Petelia. Blue Hen fans, 19,120-strong at Delaware Stadium on this game evening, can be intimidating at their lovable best, but their growl is way worse than their bite. As the 2013 edition of the Blue Hens football team came charging through their tunnel and on to the field for the first time, Brock found himself totally alone. The first-year Delaware head coach could have been the Maytag repairman as he walked from the Carpenter Center to the Blue Hen sideline. If he had looked over his shoulder, Brock could have glanced at the triad of statues standing in the foreground of Delaware Stadium, College Football Hall of Fame coaches named Bill Murray, Dave Nelson and Tubby Raymond smiling dauntingly as he walked towards the home bench. Brock could have even looked into one of the boxes in the front rows above Tubby Raymond Field and found Tubby Raymond cheering for him and the Blue Hens near the 40-yard line. Instead, Brock stopped, took a deep breath and seemed to let the whole atmosphere of the moment sink in. Admitting as much after Delaware’s up-and-down 51-35 victory over Jacksonville, Brock explained his emotions. That has been a typical, but seemingly genuine posture as Brock has moved through the past seven months after replacing K.C. Keeler. Brock is a down-to-earth kind of guy. The football business will indeed humble you. Eventually, it does that to everyone, no matter how successful, or lacking in success, you are. Just ask Brock’s predecessor, Keeler. 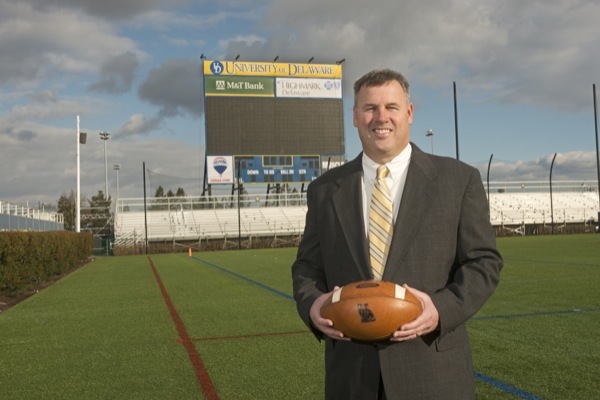 A star linebacker on Delaware’s Raymond-coached, 1979 NCAA Division II national championship squad, Keeler won a national crown in 2003 at the I-AA level in just his second year as a head coach and took the Blue Hens to two more Football Championship Subdivision title games in 2007 and 2010. Keeler’s 2010 club was one blown fourth-down measurement away from picking up another championship trophy before losing to a furious, fourth-quarter rally by Eastern Washington, 20-19. Despite going 86-52 (11-3 in FCS playoff action) and winning three Colonial Athletic Association titles in 11 years, Keeler’s 5-6 team in 2012 wasn’t deemed good enough and he was fired. Only his mentor, Raymond, had won more games at Delaware. It didn’t matter that Keeler had signed a 10-year contract extension in 2008. Such is the pressure on a Blue Hen football coach. Brock displayed a quiet confidence in his team as her prepared them in the off-season. He believes in his ability to motivate and he believes in his offensive and defensive systems. When a pair of fumbled returns led to two quicks first-quarter scores and a 14-0 Jacksonville lead on Thursday evening, Brock didn’t panic. “Panic is not going to be part of our game plan,” Brock told his team at halftime, when they retreated to the locker room with a 21-all tie. Brock showed the same demeanor when the Blue Hens began to wear down the non-scholarship Dolphins in the third quarter to take a 31-21 lead — an advantage that grew to 44-28 midway through the fourth period. With All-American senior Andrew Pierce rushing 16 times for 101 yards and a touchdown and getting help from Julian Laing (13 carries, 97 yards, two TDs) and Jalen Randolph (16 carries, 87 yards, one TD), the Blue Hens rumbled for 373 yards on the ground, doing it with a style appreciated by the aficionados of Raymond’s legendary Winged-T. Offensive coordinator Sean Devine even threw in some of those counter-type runs that were so successful in the Winged-T era and the crowd roared its approval. From a spread style attack, Brock also received good work from quarterback Trent Hurley, who was a sharp 19-of-29 for 238 yards, with one touchdown. Hurley also ran three times effectively for 27 yards. Wideouts Michael Johnson (seven catches, 104 yards) and Rob Jones (five catches, 65 yards) and tight end Nick Boyle (career-highs with five catches, 56 yards and one TD) gave Hurley some dependable targets on a night when the Blue Hens generated 611 yards of total offense. There were concerns on defense as Jacksonville’s sophomore quarterback Kade Bell burned the Delaware secondary for 261 yards and four touchdowns, completing 18-of-34 passes. Dolphin tight end Andrew Robustelli grabbed five of them for 101 yards and touchdowns of 21 and 57 yards. But the Blue Hens demolished the Jacksonville running game, holding the Dolphins to minus-37 yards on 24 carries. Delaware also sacked Bell three times and recovered three critical fumbles. There were moments that would have tried the patience of Job and did cause Brock’s blood pressure to even raise a few points. With less than four minutes to play, Jacksonville cornerback Antonio McRae stepped in front of a Hurley pass along the far sideline, intercepted it and dashed 63 yards for a score to make it Blue Hens 44, Dolphins 34. Jacksonville was just a two-point conversation away from making it a one-possession game when the Dolphins inexplicably let Dylan Lynch kick the extra point. Now down by nine, Jacksonville had two players approach the ball on the ensuing kickoff, with Brandon Behr drilling the onside attempt off the leg of a Delaware player. The Dolphins recovered at their own 43 to suddenly make it a game with 3:42 remaining. But Delaware defensive end Derrick Saulsberry wasn’t fooled on a reverse, stayed home in contain and hit Jarrius Lindsay to force a fumble. Linebacker Jeff Williams scooped the ball up at the 24 and raced into the end zone for the Blue Hens’ game-clinching touchdown. “We all wanted to win for coach,” said Pierce. As the clock ticked down to zeroes, Brock had his first head-coaching win and most of the Delaware fans left happy.